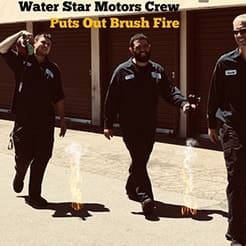 About Us - Water Star Motors, Inc.
Family owned and operated by Henry and Lisa Carter since 1993, Water Star Motors, Inc. has grown steadily on the basis of good honest repair work, a strong reputation with customers, being a Green Certified Business and being nice. We are a mechanically, spiritually and environmentally conscious auto repair shop. We were the First Santa Cruz City Certified Green Business. We are an AAA approved auto repair center. We were awarded the Small Business of the Year 2007 by Assembly member John Laird. We were voted Best of Santa Cruz in the annual Good Times reader poll of 2002, 2012 and the 2009, 2010, 2011 and 2012 Santa Cruz Magazine Goldie's awards. We are a Bosch Authorized Service Center. If your car is under warranty with the dealership or an aftermarket warranty program, we especially encourage you to come in: often, we can save you money by identifying expensive problems that may not be otherwise noticeable before your warranty expires. Our name, Water Star Motors, Inc., was inspired by a camping trip Henry and Lisa took to the Wastahi campground, in Big Basin State Park. Wastahi is Indian for water-star/falling star. At the camp ground meteor showers could be seen in the sky at night. We had been camping there the weekend before we opened the doors to Water Star Motors, Inc.. Our first location was on Water Street, then Pacific Avenue and now River Street. We work on a lot of Mercedes-Benz, which has a star logo. Alchemically speaking, if you mix fire and water, you get steam. All these things blend together beautifully in the name Water Star Motors, Inc.. We are Your Serene, Green Auto Repair Team. Our technicians are ASE Certified Technicians who participate in continuing professional education and certification. They are professionally trained car buffs who love the work they do so well, and we all benefit as a result. Henry, Lisa have assembled a team of dedicated and loyal employees who love their work and are constantly striving to improve their skills through continuing professional education. We are all environmentally conscious and willing to go the extra mile to stay Green. Henry Carter - Owner & Co-Founder of Water Star Motors, Inc.
Henry is a natural-born mechanic - sometimes known as the "Car Whisperer". He started working on cars when he was fourteen. His professional experience with Mercedes dates back to 1979, when he started his career by working for a Mercedes dealership in Colorado Springs. He is a Master Technician for Mercedes & Nissan, and is an ASE Master Technician and Advanced Level One Specialist. Henry's extensive and varied work experience has touched on nearly every import model and make - if you have a import car, Water Star Motors, Inc. can fix it! Bring it to Your Serene, Green Auto Repair Team! Henry is an avid recycler and promoter of sustainable living. Henry also enjoys the culinary arts, fine wine, meditating, travel and wood carving. 30 years working as a professional technician: Factory trained in Mercedes-Benz, Nissan, Acura and Peugeot. Has worked in Mercedes-Benz, Porsche, Audi, BMW, Nissan, Toyota and Honda dealerships. Lisa Carter - Owner & Co-Founder of Water Star Motors, Inc. The feminine presence at Water Star Motors, Inc.. Does being a ballet major pay off? Yes! Lisa's experience as a ballet dancer lends grace to whatever she does. Initially, Lisa got her hands dirty under the hood assisting husband, Henry, with car maintenance, repairs and advising. However, now the business has grown to the point where Lisa and Henry have a team of highly trained technicians and service advisers to assist them, Lisa is able to focus on issues behind the scenes, including directing Water Star Motors, Inc.' marketing, finances and writing Rock, Paper, Car for Santa Cruz Weekly as well as Waterstar's Blog: The Sage Mechanic. Says Lisa: "It is so good to work with such a great team of smart, harmonious hard workers. They are my serene, green, auto repair team!" Lisa is an advocate for sustainable living (let's save our planet one person at a time). She is a great listener, organizer and get-it-done kind of gal. Lisa not only loves to meditate herself, but she teaches meditation classes as well. Aspirations, beliefs or goals as a human being: Love is what makes the world go round. My goal in life is to keep my family strong and raise my children to be happy, loving, productive individuals. Experience, Education, Credentials, Achievements: I have worked in the automotive industry most of my adult life. I love learning new things every day. I have been to Service Advisor School & trainings. Currently I am in a yearlong Advisory Master Group. I believe in better business through communication. Kristen is currently active in a Santa Cruz Leads Club. Unique Quirks, Soft Side of Personality: I like to get to know new people and build lasting relationships with customers. I have had success as a hospitality manager in my life. What you bring to Water Star Motors: As you imagine, I am a certified Carter. I like the excellent, sincere customer service and Water Star Motors’ great attention to detail. My passion is to keep the business with a family-run atmosphere. Anecdote (Short account of a funny incident/event in auto repair or other): June, 2018; I saw smoke within the block of our shop and called 911. They asked me to confirm if there was an actual fire. Meanwhile, my technicians ran around the corner, confirming it was a brushfire. I handed them a fire extinguisher over the fence. They problem solved by using a hose from a house near to the fire and were successful in putting out the fire. They saved the nearby home as well as acres near the levy. I was able to put this article in the SC Sentinel. One of the founding members of the Exchange Club of Santa Cruz County, Henry Carter has been an inspiration in communicating the value of the Exchange Club to many notable people in our city. The Exchange Club is an all-volunteer service organization for men and women to serve their community, develop leadership skills and to develop friendships. A natural leader, as president of the club, Henry developed a core of inspired volunteers to participate in many activities within our first year of membership. He bolsters their confidence and helps them recognize that they have valuable qualities. Henry's enthusiasm and leadership has spurred the club on to many accomplishments over the past year. We are supporters of CASA, Boys and Girls Club, Walnut Avenue Women's Center, Second Harvest Food Bank, Ecology Action, Green Business Program, Young at Heart, Chee Hau Center, Santa Cruz High School Athletics, the Exchange Club to mention a few. Henry and Lisa's Top 10 Why should your car be serviced at Water Star Motors, Inc.? Our primary goal is to create an exchange of abundance with you that begins with our providing the highest quality of service for the best price in order to ensure your satisfaction and is completed with referrals of your friends to Water Star Motors, Inc.. Thank you. We believe in customer service. We are friendly. We do our very best to hear what you have to say about your car. We provide every possible means to make it convenient for you. From Early-Bird Drop-off to shuttle service to your home or office to (almost always) same day service. We have a staff that is highly trained and is constantly getting new training to hone their skills. Also, we keep up with the necessary technology in order to communicate with your vehicle. We have the latest test equipment available to help us make the proper diagnosis for the problems your car may be having. We believe in a VALUABLE FINAL PRODUCT. Your vehicle is test driven to ensure everything's perfect for you. We have one of the longest warranties among local shops: Labor and new parts 24 months-unlimited mileage (does not cover wear items such as brakes & belts or labor for lifetime parts). We believe in preventive maintenance and strive to alert you to your car's upcoming scheduled services. We perform a complete vehicle inspection each time we see your car and advise you on safety issues and potential problems for the future. You will not only save time and money with us but will obtain the peace of mind that comes from knowing your car is safe, reliable and optimally maintained. Water Star Motors, Inc. is on the radio! Click below to listen to our radio ad.